This article is part of an ongoing series honoring individuals who have made a difference in the world by applying a GIS solution to challenges or needs within conservation or their communities. Since these unique individuals have been selected for their innovations or special achievements in a particular field, the series is appropriately named GIS Heroes. Esri recognizes Governor Martin O'Malley as a GIS hero. Governor Martin O'Malley of Maryland believes that geography matters to the people he serves. For him, it is critical to the relationships that sustain us and vital to making government work for the people. "When you show people how you are using GIS, they inevitably ask this question, �Can you show me my house?'" says O'Malley. "People want to know that they matter to their government and that their government is relevant to them. They want to understand the forces at work around them." He continues, "This question speaks to the innate human need to understand the relationship of oneself to others and to the world we live in. With GIS, we develop a deeper understanding of our actions across time and space. With that knowledge, we can progress in a way that strengthens our relationships with one another and with the earth." O'Malley's career has always been focused on service. After graduating from the University of Maryland School of Law in 1988, he began his career as an assistant state attorney for the City of Baltimore. Three years later, he was elected to serve on the Baltimore City Council. And then he was elected to govern the city from 1999 to 2007. During his first of two terms as mayor, O'Malley learned of COMSTAT, the successful GIS-based program the New York City Police Department (NYPD) was using to revolutionize crime fighting. He began to consider applying the same method of performance accountability to improve life in Baltimore. "The NYPD was using GIS to map crimes, deploy more cops to those areas, and maintain close follow-up on hot spots to drive crime down," explains O'Malley. "We began to realize that if [the NYPD] could use mapping technology to improve law enforcement, it could also be used to improve other government activities, everything from removing dead trees to repairing traffic lights and collecting garbage." At the time, the City of Baltimore was facing high rates of violent crime, absenteeism and overtime, slow response time to citizen complaints, and illegal dumping, to name just a few of the problems. Seeking change, in 2001 the governor implemented CitiStat, a performance-based management process that holds government agencies accountable. GIS is at its heart. Each week, O'Malley and top cabinet members would meet with representatives from a city agency to analyze data, field research, and resident feedback. The GIS-based analysis provided a framework for discussion and a way to see patterns, problems, and ways forward. "We started using GIS to map every conceivable service, problem, and opportunity so we could measure outcomes and performance every day," says O'Malley. "Then we were able to adeptly deploy resources and make real progress." The results of the CitiStat program are remarkable. During O'Malley's tenure, for example, violent crime dropped 40 percent, the number of children with lead poisoning fell 65 percent, and the cleaning and boarding of vacant houses moved from response times of 319 days for cleaning and 152 days for boarding to 5 days for each. "Governor O'Malley pushes GIS initiatives forward because they give him the information he and his staff need to quickly and comprehensively understand issues and examine program effectiveness," says Kenny Miller, Maryland's geographic information officer. "By displaying program information on a map, a clear picture emerges showing the best ways to target resources, track performance, and reach out to the public." Though O'Malley has moved on to govern the state, CitiStat remains a vital program in the mayor's office, and the same model is now used in cities across the United States, such as Springfield, Massachusetts, and Buffalo, New York. 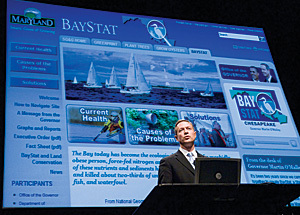 When O'Malley became governor of Maryland in 2007, he brought the CitiStat ideals with him and developed StateStat, which expands the CitiStat model to a state scale and even includes stimulus spending statistics. Currently, the following agencies participate in the process: the Maryland State Police and the Departments of Agriculture; Business and Economic Development; Environment; General Services; Health and Mental Hygiene; Housing and Community Development; Human Resources; Juvenile Services; Labor, Licensing, and Regulation; Natural Resources; Planning; Public Safety and Correctional Services; and Transportation. "There is great power in merging mapping, human effort, and imaginative public policy," states O'Malley. "Government has traditionally been very good at measuring input, and not as good at measuring output. This is where GIS comes in to propel progress. Just as it is impossible to steer a ship without a compass or controls, it is impossible to drive government forward without measuring outputs and outcomes. It is only with that information that we know where challenges and opportunities lie. With GIS, we can all see exactly where and how progress is being made or where it is stalling." With BayStat and GreenPrint, which measure Chesapeake Bay restoration projects and land conservation, respectively, the governor has expanded his performance measurement programs in Maryland. They measure the health of the environment in Maryland, help the government make decisions about the best ways to implement effective conservation strategies and preserve green spaces for future generations, and provide effective communication with stakeholders and the public. "Sustainability is a defining issue of our times," O'Malley notes. "In Maryland, we must focus on improving the condition of the Chesapeake Bay, which has been polluted for generations. We are tackling this issue with the same approach we took with CitiStat and StateStat—using geography and performance measurement to improve the bay's health each year." GreenPrint supports BayStat efforts, and the GIS-based GreenPrint Web mapping application serves as the framework for discussion in the combined BayStat/GreenPrint meetings. GreenPrint data is also accessible via MD iMap, Maryland's launched portal into the state's enterprise GIS. MD iMap (mdimap.com/imap), which includes seamless, geocoded centerlines and six-inch imagery for the entire state, provides an overarching look into Maryland state government performance. It gives citizens, government staff, and other stakeholders access to a variety of information, such as designated open spaces, protected targeted ecological areas, and the progress of highway beautification projects. "Governor O'Malley's administration has made what was once impossible become reality in Maryland—bringing together state and local government to form a uniform GIS foundation across the entire state of Maryland," says Marshall L. Stevenson III, enterprise GIS and public safety manager, Frederick County, Maryland. "This was first seen with the statewide road centerline and geocoding service project and is now moving forward with the soon-to-be-created statewide vector cadastral layer, with data provided by local jurisdictions." For more information, contact Lindsay Major, governor's office, State of Maryland (tel. : 443-336-1483, e-mail: lmajor@gov.state.md.us).